I'm a doctoral student working in the Distributed Computation Group led by prof. Keijo Heljanko. Kähkönen, K., Saarikivi, O. and Heljanko K.: Unfolding Based Automated Testing of Multithreaded Programs. 2014. (doi: 10.1007/s10515-014-0150-6). 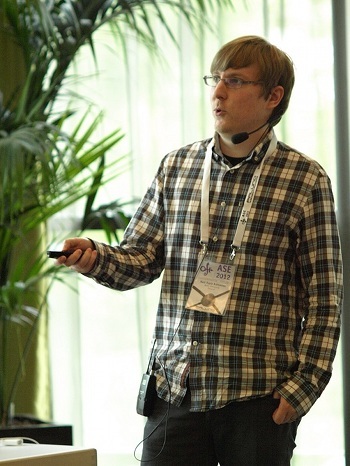 Kähkönen, K. and Heljanko K.: Lightweight State Capturing for Automated Testing of Multithreaded Programs. In Proceedings of the 8th International Conference on Tests and Proofs (TAP 2014), pages 187 - 203, July 2014, York, UK. Kähkönen, K. and Heljanko K.: Testing Multithreaded Programs with Contextual Unfoldings and Dynamic Symbolic Execution. Accepted for publication. Kähkönen, K., Saarikivi, O. and Heljanko K.: LCT: A Parallel Distributed Testing Tool for Multithreaded Java Programs. In Proceedings the Sixth International Workshop on the Practical Application of Stochastic Modelling (PASM'12) and the Eleventh International Workshop on Parallel and Distributed Methods in Verification (PDMC'12). Electronic Notes in Theoretical Computer Science (ENTCS), Volume 296, 16 August 2013, Pages 253-259. Kähkönen, K., Saarikivi, O. and Heljanko K.: Using Unfoldings in Automated Testing of Multithreaded Programs. In Proceedings of the 27th IEEE/ACM International Conference on Automated Software Engineering (ASE 2012), pages 150-159, 3-7 September 2012, Essen, Germany. Kähkönen, K., Launiainen, T, Saarikivi, O., Kauttio, J., Heljanko, K., and Niemelä, I.: LCT: An Open Source Concolic Testing Tool for Java Programs. In Proceedings of the 6th Workshop on Bytecode Semantics, Verification, Analysis and Transformation (BYTECODE'2011), pages 75-80, Saarbrucken, Germany, Mar 2011. Kähkönen, K., Kindermann, R., Heljanko, K., and Niemelä, I.: Experimental Comparison of Concolic and Random Testing for Java Card Applets. In Proceedings of the 17th International SPIN Workshop on Model Checking of Software (SPIN'2010), pages 22-39, Lecture Notes in Computer Science 6349, Twente, The Netherlands, September 2010. [ PDF ] Kähkönen, K.: Automated Dynamic Test Generation for Sequential Java Programs. Master's Thesis. Helsinki University of Technology, Department of Information and Computer Science, Espoo, Finland, July 2008. [ PDF ] Kähkönen, K. Automated test generation for software components. Technical Report TKK-ICS-R26, Helsinki University of Technology, Department of Information and Computer Science, Espoo, Finland, December 2009. [ PDF ] Lampinen, J., Liedes, S., Kähkönen, K., Kauttio, J., and Heljanko, K. Interface specification methods for software components. Technical Report TKK-ICS-R25, Helsinki University of Technology, Department of Information and Computer Science, Espoo, Finland, December 2009.